NVIDIA GeForce 9800 confirmed to be on show at CeBIT 2008! 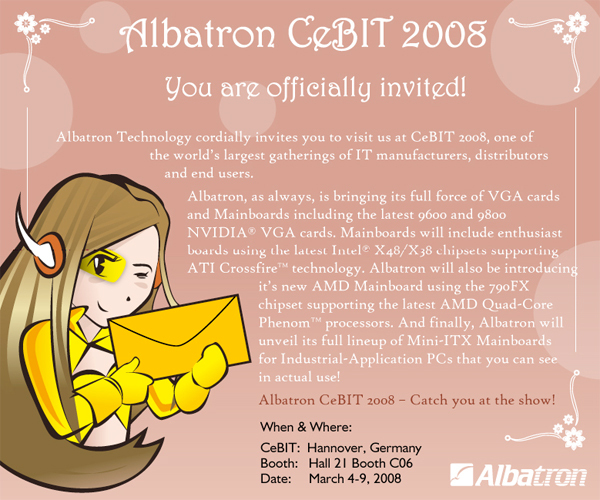 There's always speculation regarding just who will be showing what at consumer shows and next month we have one of the biggest in the form of CeBIT 2008, taking place in Hannover, Germany from March 4th to 9th. Fortunately for us, we won't have to speculate as to what will be on show at Albatron's stand. Its official invitation, pictured below, tells us everything we need to know. First mention goes to NVIDIA's forthcoming 9600 and 9800 GeForce graphics cards, which promise to take back the crown from ATI's HD 3870 X2. Previously delayed and now rumoured for release in late February or early March, we'll expect the NVIDIA cards to feature in full force from various manufacturers at the show. Also on display from Albatron will be a selection of enthusiast motherboards, ranging from boards using Intel's X38 and X48 chipsets and an AMD board using the 790FX chipset. HEXUS, as always, will be on hand at CeBIT to provide hands on coverage of the event. :) … You guys have a lot of cool stuff coming from us! It's nice to see some graphics cards being released… Games (Begins with C and has 6 letters) were starting to catch up with nVidia, even if AMD wasn't. Ooooooh, this'll be great, hopefully by the time I come to building my new computer (6-9 months away yet :rolleyes:) the prices will be better, or at least the 8 Series will have better prices. …or at least the 8 Series will have better prices.